The display is 12 digits, amber 'Panaplex II' gas discharge. The calculator is powered by 4x D size rechargeable cells. This model has advanced scientific functions, but is not programmable. 140 mm x 230 mm x 70 mm (5.5" x 9" x 3"). The electronics in this example are date coded to the end of 1972. 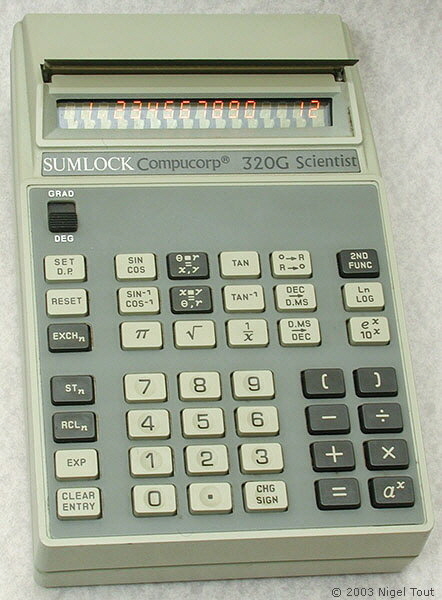 Made in the U.S.A. by Compucorp (Computer Design Corporation) of Los Angeles, and supplied as the OEM to Sumlock Anita Electronics Ltd.